If the company you work for supports non-profit organizations with in-kind donations, advertising or matching gifts, please let us know! We are also searching for raffle prizes. Could your company donate one? The Peanut Butter & Jelly professional adult company is also looking to forge new connections with local schools. You can help by recommending us to your child’s principal or cultural arts coordinator or by putting us in touch with your PTO or community organization. Our office has a small “Store” where we sell after class snacks, T shirts, and books. All proceeds fund PB&J programming. PB&J T shirts – $12. Book: Dance! With Bill T. Jones by Bill T. Jones, photos by Susan Kuklin. Bill T Jones, a renowned performer and choreographer explains and shows his love of dance in this photo-essay picture book. Pages include close-ups and full-body shots, with child friendly captions that encourage dancing and show the complexity of movement. This beautiful book complements what we teach in our classes. We also fundraise, because it is our fervent dream to make attending daCi (dance and the Child international) conferences a permanent part of the SMALL FEETS program. These conferences are fabulous opportunities to share dance with dancers from around the nation or the world. A parent once told me that the daCi Intergenerational Gathering was the finest educational experience her child had had to date. Other parents agreed. daCi conferences are the kinds of high-quality experiences that we want for our children and adults: learning, sharing, engagement, process and production, non-competative, and lots of fun. 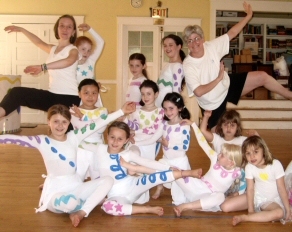 We wish bring our group to the next daCi USA Intergenerational Gathering in Texas during the summer of 2011 to add our dance to others from around the country. We would like to take every dancer and SMALL FOOT who would like to go, but we need to make that possible for some children and dancers. This kind of outreach is impossible without help from supporters. It will take our whole community to make it possible. Advertisers and sponsors will be listed in programs for performances across the year, posted in our dance space in Brookline, and linked in our website all year. Please consider supporting us by advertising or making a sponsorship donation. Advertisers must supply camera-ready copy. We can assist with this. Messages can be typeset by us. Ads may be transmitted electronically to info@pbjdanceco.org, as pdf or MS Word files. Alternatively, you may wish to be listed as a contributing benefactor or to make an anonymous contribution. Contributions are tax-deductible. Material must be accompanied by payment. Checks should be made out to PB&J Dance Company. If you have any questions please call us at 617.738.7688. We hope you will join with other businesses and individuals in sponsoring a beloved Brookline institution! You are also invited to attend all concerts and events! In order to protect privacy, we only list sponsors in printed materials. LINK TO YOUR WEB SITE!! inclusion in current program materials. Materials are re-printed across the year and new ads are always welcome.